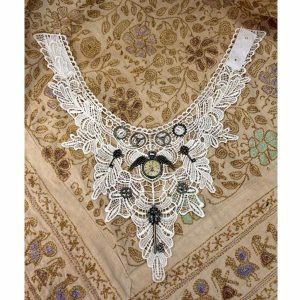 This beautiful Venetian white lace collar has a high neck made from cotton which is comfortable and practical to wear. The lace wraps around at the back so the back of the neck is kept warm. When the day warms up, you just take off the collar. 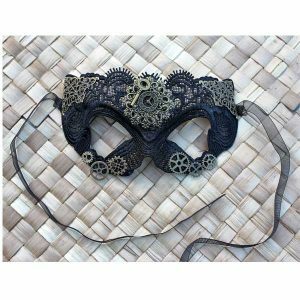 This is a stunning final touch to a steampunk, Goth or Victorian costume, or wear it with a plain top anytime to upgrade it into something special. The collar fastens at the back with a choice of buttons for different width necks. 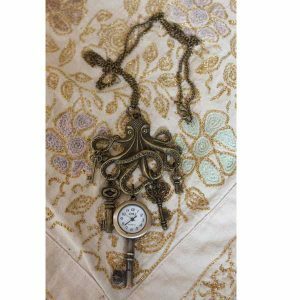 Cotton and lace, with button closure. Plastic domes on the cuffs.